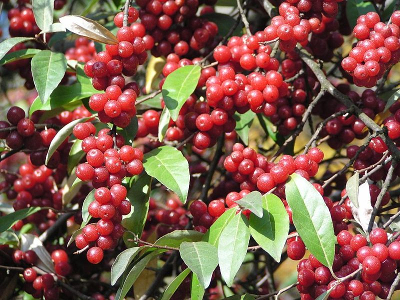 Autumn olive is a hardy edible berry bush with fertilization (nitrogen-fixing) capabilities, that can be an excellent addition to your property as part of permaculture or survival homesteading plans - depending on what part of the country you live in. 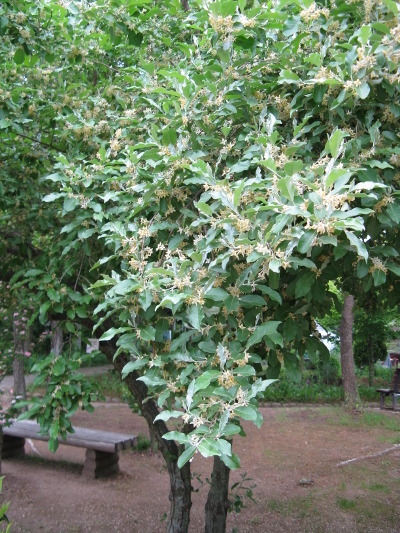 It is a shrub or small tree in the plant family Elaeagnacae that is native to China, Japan, and Korea. It first reached North America as early as the 1830’s, however the plant did not reach national prominence until the 1950’s when it began to be promoted as a way to provide wildlife habitat and re-vegetate disturbed soil sites. Unfortunately, it quickly became a major invasive plant turning large tracts of land in middle America into monocultures. Now it straddles the fence between problematic invasive and multi-use permaculture plant - depending on which part of the country you are in. General: Autumn olive is a small rounded tree or shrub that can reach 20 feet in height. 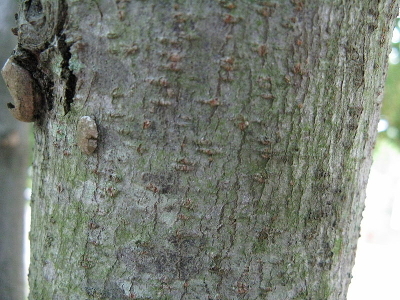 Bark/twigs: The bark on the main stem is thin and light gray. The young twigs are silvery with brownish scales giving the twigs a highly textured appearance; with age the twigs take on the light gray appearance of the main stem. Leaves: The leaves are alternate and elliptic to oblanceolate in shape with tapered leaf bases and acute leaf tips. 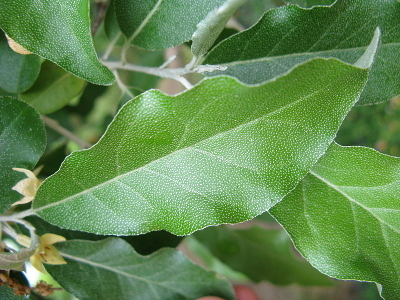 The dorsal portion of the leaf blade is dark green and lightly covered in silver scales. The ventral portion of the leaf blade is silvery. The internodes between leaves tend to shorten near the terminal end of the twig giving the leaves a clustered appearance. The leaves are pinnately-veined with thin lateral veins and inconspicuous sub-lateral venation. The leaf margins are lightly sinuate and entire. Flowers: The flowers are light yellow in coloration and salviform in shape, with a four-petaled corolla and four stamens. Fruit: Young fruits are ovoid in shape, greenish with silvery scales and ripen to a speckled, rounded red fruit. 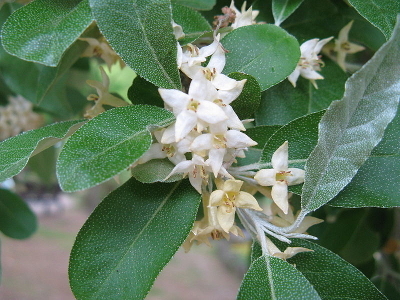 Autumn olive, like many other plants in the Elaeagnacae family, is a nitrogen fixing shrub (due to its symbiotic relationship with bacteria in the genus Frankia) which allows it to colonize poor quality soils. It grows best in well-drained soils on sunny exposures. The flowers are primarily insect pollinated (bees) and the fruits are a favorite of birds (a primary mode of seed dispersal). It is not a favored browse species for white-tailed deer. Autumn olive can be grown as part of a food forest system for both their edible fruit and for their nitrogen fixing capabilities. It is not known to be invasive in the west coast region of North America. Fall and spring are the best times to plant this perennial shrub. Since the 1950’s autumn olive has become a significant invasive species in the central and eastern parts of North America. The plants produce a tremendous amount of seed per plant (up to 200,000 seeds per plant per year) with a high germination rate. The plants are excellent at colonizing poor soils due to their nitrogen fixing capabilities, and can tolerate a wide range of micro-site conditions (drought and coastal salt spray). The seeds are readily dispersed by birds, and the foliage is browsed at a much lower rate by white-tailed deer than native vegetation. It is also able to out-compete native vegetation by shading the understory. Because of its invasive status in some areas, in some states it is illegal to buy and sell autumn olive plants! Autumn olive can be a difficult shrub to eliminate once established (in central and eastern parts of North America). The most effective method of control on smaller specimens is hand pulling before the shrub can produce a seed crop. Larger specimens can be successfully removed by cutting at the base of the stem/trunk and then applying a commercial herbicide to the cut which inhibits regrowth. Autumn olive has become a plant of controversy. Once touted as a plant with a bright future across the continent, its success is now disrupting local ecosystems in the midwest and eastern parts of the country. Despite the issues it is still planted and employed as part of successful permaculture systems, especially in the west coast (where it does not behave as an invasive plant). It may yet prove to be a benefit in certain areas of the country, but for now proceed with caution if you wish to make this plant part of your permaculture or homesteading schemes. 1)	"Pfaf Plant Search." Pfaf Plant Search. Autumn Olive, n.d. Web. 12 July 2016. 2)	"The Nature Conservancy." About the Invasive Autumn Olive. The Nature Conservancy, 2016. Web. 12 July 2016. 3)	"Thunder Bay Permaculture." : Plant of the Weekish. Thunder Bay Permaculture, 25 Aug. 2014. Web. 12 July 2016. 4)	Practic, Invasive Species—Best Control. Invasive Species—Best Control Practices Autumn Olive (n.d.): n. pag. Autumn Olive. Michigan Department of Natural Resources, Feb. 2012. Web. 12 July 2016. 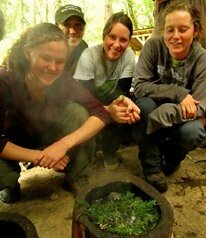 Learn all about useful cultivars and sustainable living skills in our Permaculture Courses.